The females of all the Sunbird species look very similar...they are not as showy as the males, but are elegant and lovely, and less fearful. 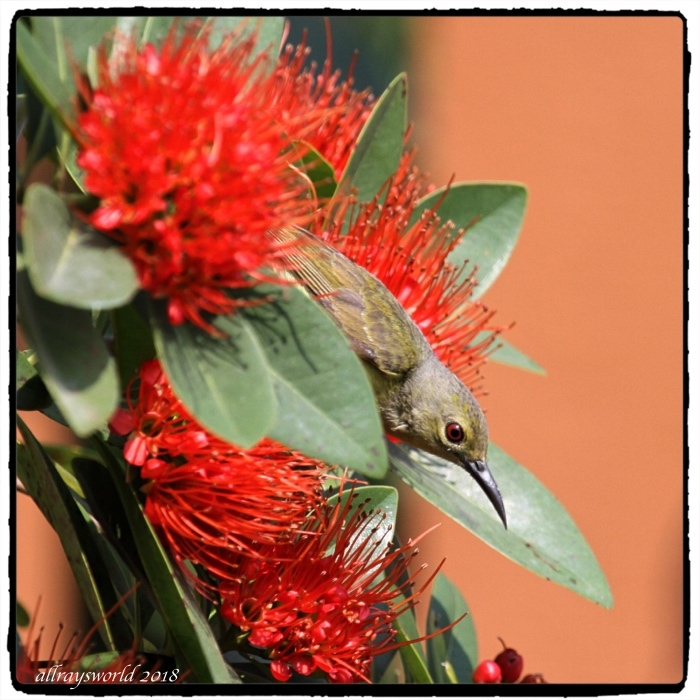 The top picture is of a female Purple Sunbird, and the lower picture is of a female Brown-throated Sunbird. Tu as de la chance d'avoir tous ces beaux oiseaux dans ton jardin. Ray: Nous plantons des arbustes à fleurs odorantes pour attirer les oiseaux, Martine, et ça semble fonctionner. Ray: A sipper...not a guzzler...Larry. Elegant was the word that sprung into my mind as soon as the top photo opened! Not just the bird, but the pose you've captured! Ray: That word seems to summarise the different behaviour of the females compared to the males, Elizabeth. Do you have problems IDing the females, Ray? Ray: I was already familiar with the Purple female, Lisl, so was able to pick the few differences between it and the Brown-throated [red eyes, slightly bigger bird, a tinge of gold in the wing feathers]. Ray: They are as you say, Chris. Tes photos sont vraiment magnifiques Merci !! Ray: Les Sunbirds sont des sujets merveilleux, Claudine. She is very elegant looking Ray. Ray: I like the female Sunbirds a lot, Chad. Her eyes match the colour of the flower. I like the colour of her breast. Ray: The Brown-throated Sunbird has attractive red eyes, but the Purple's are black, Alan. Ray: Lovely critters and a delight to host, Bill. I find the female sunbird showy with her yellow breast. Ray: She is very attractive, Philine. The birds seem delicate. We are getting a great look at that shrub too. Ray: Very small, and lightly built, Mary. Ray: I love having them in the garden where I can observe them any time I like, Tom. Ray: I like the females a lot, Peter. They do look very similar. Ray: Just small differences...like red eyes or black...Brian.